A power of attorney grants another person the authority to make medical or financial decisions and act on your behalf. We create and use these legal documents for various purposes during the estate planning process, but the two most common are financial power of attorneys and heath care power of attorneys. 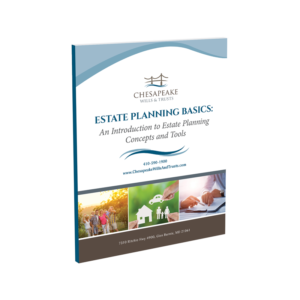 The estate planning team from Chesapeake Wills and Trusts can help you create individual estate planning tools or develop a comprehensive estate and asset protection strategy on your behalf. Call us today at 410-590-1900 to talk about your need for a power of attorney or to learn more about how our estate planning services can help you. A power of attorney gives a person, called the agent, the authority to make decisions and manage certain legal tasks on behalf of someone else. This does not limit the person’s ability to make decisions on his or her own; rather, it grants someone else the power to do so if the first person is unable to do so for whatever reason. We frequently use powers of attorney to help families maintain control of financial matters and medical care if their loved one becomes incapacitated. It is important to note that we should create powers of attorney early as a part of your estate planning. If we wait until you or a loved one already suffers from an illness or injury that impairs thinking, the process will be much more difficult. A financial power of attorney allows the agent to make a wide range of decisions on behalf of the person who created the document. This type of power of attorney is most frequently used to allow a spouse or other close family member to manage all aspects of a loved one’s finances. • Handle real estate deals. We will help you understand what exactly a power of attorney can and cannot do, and craft the document that grants the powers to allow your affairs to continue in the event of your disability. A medical power of attorney allows someone to make medical decisions on your behalf in the event you are unable to do so. This medical power of attorney will permit the person you appoint to speak with your doctors and make important, informed, decisions, such as whether to provide or withhold certain treatment. If you fail to appoint a medical power of attorney, a guardian might need to be appointed by the court to make medical decisions on your behalf. At Chesapeake Wills and Trusts, our team offers a wide range of high-quality estate planning services that can meet the needs of your entire family. We can help you create a comprehensive estate and asset protection plan, including the powers of attorney that will allow your loved ones to make financial and health care decisions on your behalf if you cannot. We can help you understand powers of attorney, and how these documents play a role in an overall strategy to give you peace of mind about your future and your family’s financial health. Call our office today at 410-590-1900 or contact us online to discuss your needs with a member of our estate planning team.